Shoulder bursitis is a very painful inflammation of small sacs that cushion the bones, tendons, and muscles surrounding your shoulder blade. Shoulder blade pain treatment depends on the severity of your inflammation. The Mayo Clinic states that your age, activity level, and medical conditions like diabetes and rheumatoid arthritis greatly affect your risk of developing shoulder bursitis. For milder cases of shoulder bursitis, treatment can be administered at home. In cases where the shoulder pain is much more severe, X-rays and other diagnostic tools will determine if more serious treatment options are needed. Rest. By elevating the affected area and relieving pressure, the swelling may go down on its own. Ice. A cold compress will typically reduce swelling in mild cases. Massage. Soft tissue massages can reduce inflammation for short-term treatment. Medicine. Aspirin or ibuprofen can reduce swelling and relieve pain temporarily. Your doctor may prescribe stronger medication like corticosteroid injections if the pain is very strong. Support. An armband or cane could help to relieve tension and pressure on your shoulder joint. Therapy. Exercising and stretching an afflicted shoulder can reduce the risk of a repeat injury. Surgery. Torn tendons will require surgery to repair the bonds that have been severed. A strict exercise regimen will be needed for up to 6 months after the operation. If your pain lasts longer than two weeks and you have excessive swelling and redness, fever, or sharp pains, you should consult a medical professional immediately. A physician will conduct an examination to determine the exact cause of your severe pain and what treatment will be most effective. 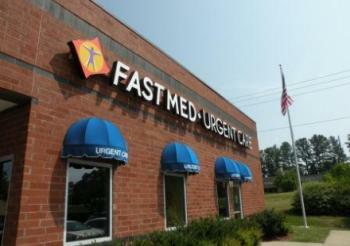 FastMed Urgent Care clinics provide service that is fast, compassionate, and affordable. We have locations open 365 days a year, and we can find the cause of your shoulder bursitis quickly, with on-site labs and X-rays. We accept all major forms of insurance, including Medicare and Medicaid so check out our Insurance page to verify that your plan is accepted. Like us on Facebook and follow us on Twitter to find out more about FastMed Urgent Care in your community! When you are ready for fast relief from your shoulder bursitis, come get the treatment you need at FastMed Urgent Care!